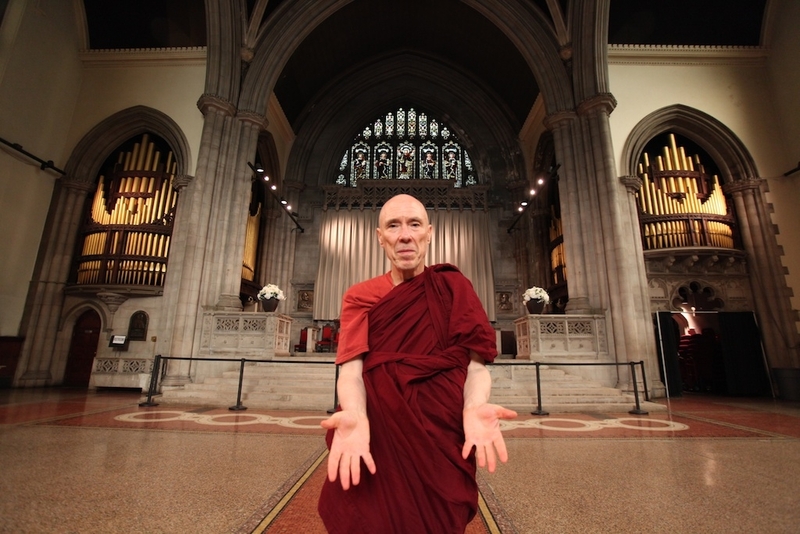 American scholar and Theravada monk Venerable Bhikkhu Bodhi might not receive the same high-profile press coverage as the Roman Catholic Church’s charismatic standard-bearer Pope Francis, but it is becoming evident to Buddhism watchers and commentators that his message is every bit as bold, eloquent, and sophisticated as the Pope’s. The recent focus on Bhikkhu Bodhi and other courageous Buddhist leaders who are highlighting imminent threats such as climate change or global hunger might well be influenced by a popular resonance with the urgency with which Pope Francis speaks about ecological catastrophe and poverty. Whatever the reasons, Bhikkhu Bodhi’s actions speak loudly for themselves. As the founder and chair of humanitarian organization Buddhist Global Relief (BGR), his activist work centers specifically on the issues of climate change (he is a spiritual ambassador for the interfaith climate change movement Our Voices) and hunger relief. “When we started BGR, we initially set our mission to help those afflicted with poverty, disaster, and societal neglect. But after a short time we realized that this was too vague and not practical. Even large, well-established humanitarian organizations like CARE and Oxfam have more precisely defined missions. As a tiny Buddhist organization, we could not tackle the whole range of human challenges on this planet without dissipating our energies,” he says. Bhikkhu Bodhi’s visibility in American public discourse over the past several years, especially as a representative of a “minority” religion in the US, is already impressive. In May this year, he was at George Washington University and the White House to discuss Buddhist civic engagement and the types of policies that Buddhists would like to see implemented. From a long-term perspective, however, Bhikkhu Bodhi doesn’t believe that the small number of Buddhists in the US as a discrete movement can have a significant impact on civic life. He continues: “The major threat I see today lies in the ascent of a purely utilitarian worldview driven by a ruthless economic system that rates everything in terms of its monetary value and sees everything as nothing more than a source of financial profit. Thus, under this mode of thinking, the environment turns into a pool of ‘natural resources’ to be extracted and turned into profit-generating goods, and people are exploited for their labor and then disposed of when they are no longer of use,” he warns, echoing many similarly dire warnings from other religious public figures. He invokes the idea of dependent origination to explain the need to see the interdependence between states of mind (particularly those governed by greed and delusion) and an economic system built on the premise of unlimited growth on a finite planet. If humanity is to avoid a horrific fate, Bhikkhu Bodhi concludes that a double transformation is necessary. First, we must undergo an “inner conversion” away from the quest to satisfy proliferating desires and the constant stimulation of greed or craving. But change is also needed in our institutions and social systems. Bhikkhu Bodhi suggests that people turn away from an economic order based on incessant production and consumption and move toward a steady-state economy managed by people themselves for the benefit of their communities, rather than by corporate executives bent on market dominance and expanding profits. This entry was posted in Buddhist social ethics, Climate change, Engaged Buddhism, News item, Social justice and tagged Bhikkhu Bodhi, Climate change, Engaged Buddhism, Global hunger, Social justice. Bookmark the permalink. I know that not all perceive him this way, but I find Bhikkhu Bodhi’s attention to global issues of hunger, climate crisis, unjust economies, and food insecurity across the world inspirational, and I’m glad that a leading Pali Canon scholar and a Theravada monk whose life is so exceptional would step forward with this clarion call for internal and external change. I feel that “Team Theravada” (sorry) needed his involvement, and in just a short time, he has become the most articulate spokesperson and change agent for these issues across the entire western Buddhist spectrum.